The very best way to kick off any bash is with cocktails and appetizers! As your guests gather and visit, it’s the perfect time to nibble and nosh. 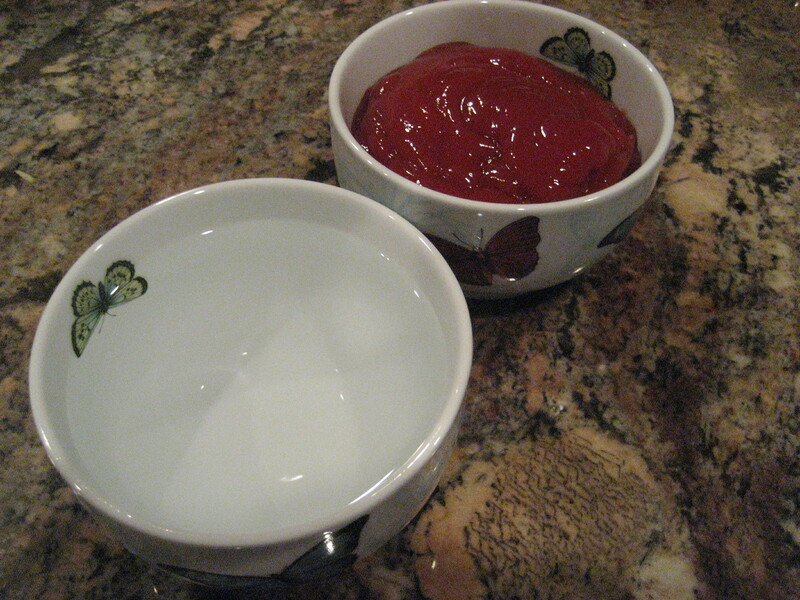 Even if I’m serving a big meal, I like to treat my guests to delicious starters. My Fourth of July celebration is no exception! Really now, what is there to say about preparing cheese? 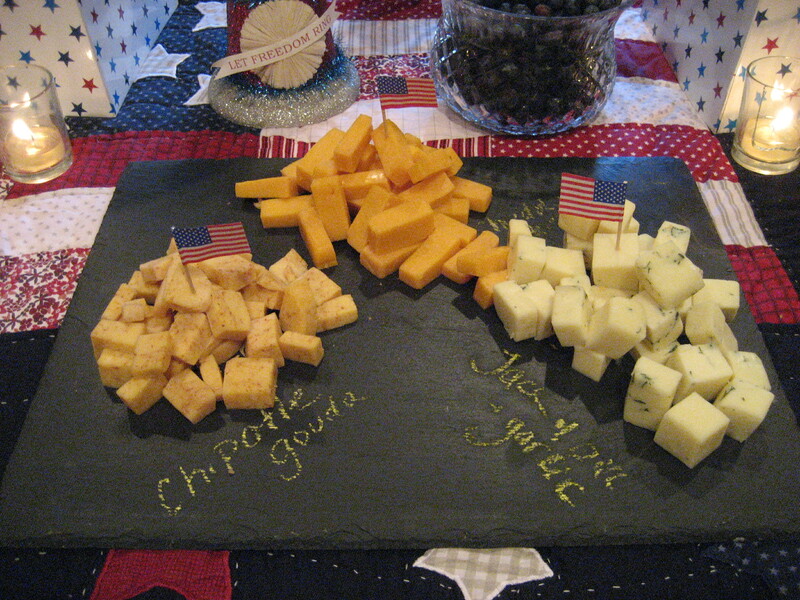 I like to select a nice variety, for instance, at my 4th of July party I am serving; Chipotle Gouda (creamy and spicy! 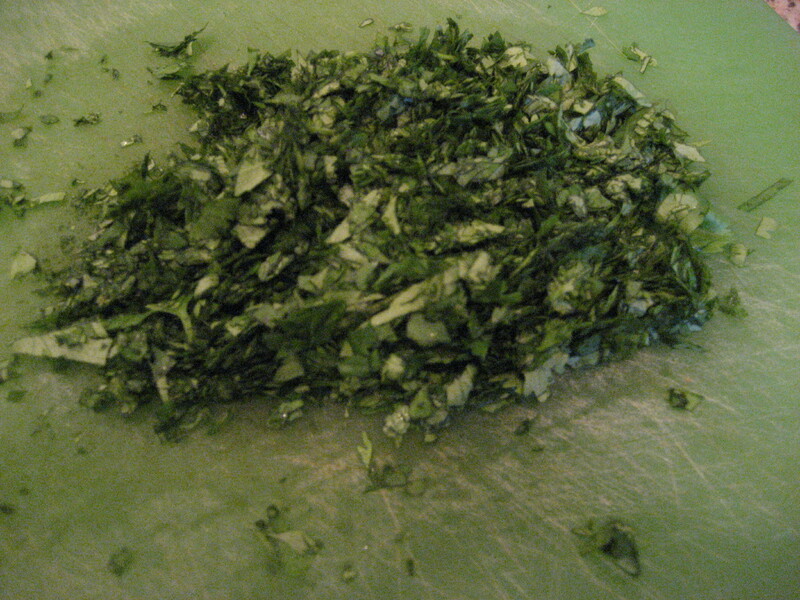 ), Monteray Jack with Dill and Garlic (such fresh flavors!) and a Yellow Cheddar with Horseradish (not your everyday cheddar). 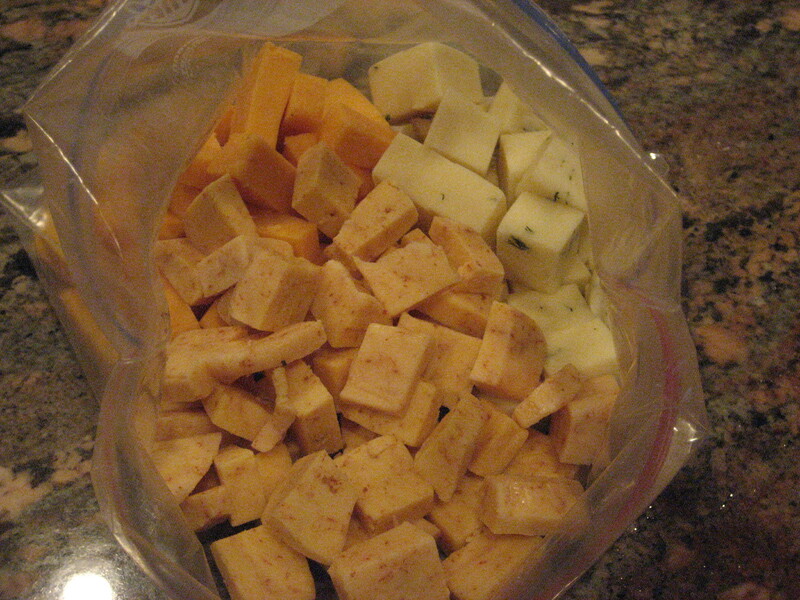 For the sake of streamlining my preparations, I cube the cheese the night before and store it in none other than a Ziploc Baggie (the object of my obsession). I believe that I mentioned a certain fabulous slate cheese board that my friend Mrs. Lilly found for me from William Sonoma…. The night before my party, I write the names of the cheeses in chalk directly onto the slate. Informational and quirky! You know how crazy I am for cracked black pepper, so I always serve my table water crackers and my Triscuit’s with a little kick! Talk about a wallop of flavor, especially if you are partial to a classic little drink from South of the border…. 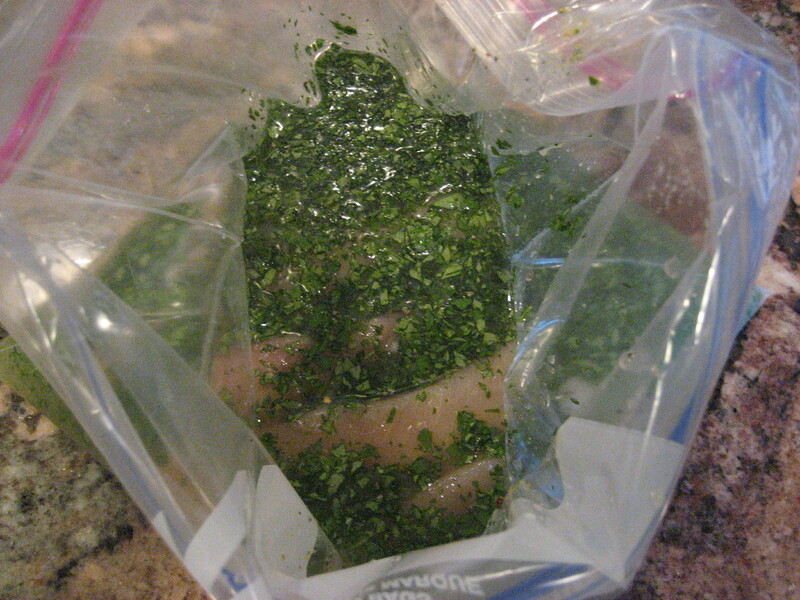 Squeeze the air out of the bag and marinade over night. 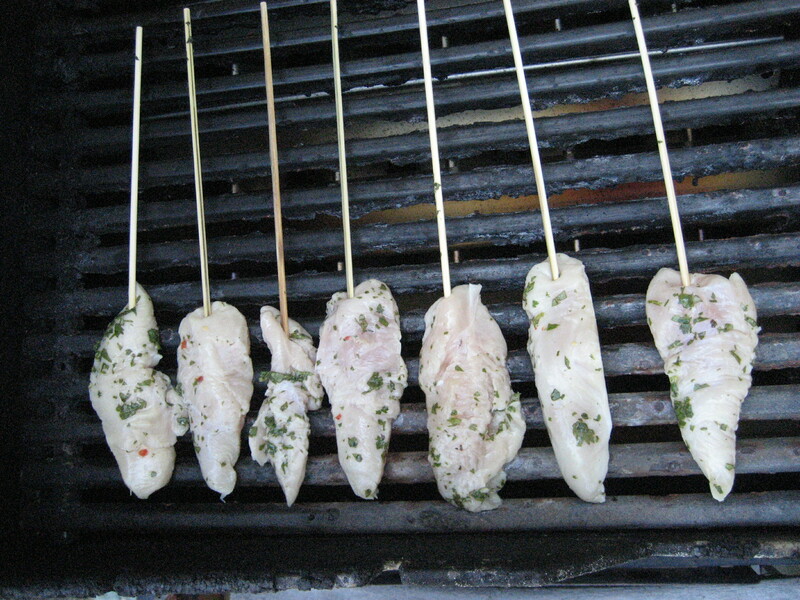 Prior to grilling, soak enough wooden skewers for each chicken strip in water. 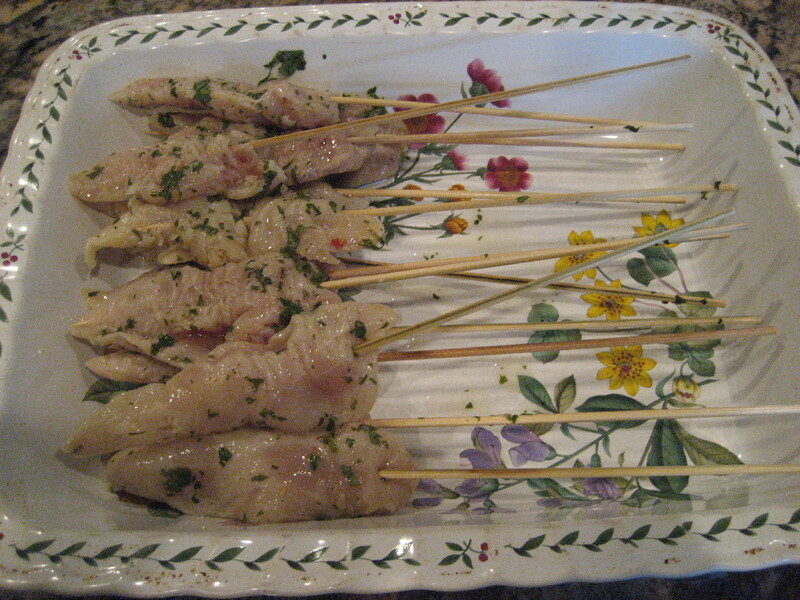 Remove chicken from the marinade and thread each individual strip onto a skewer. Pre-heat the grill to medium. Oil the grate and grill for several minutes per side. 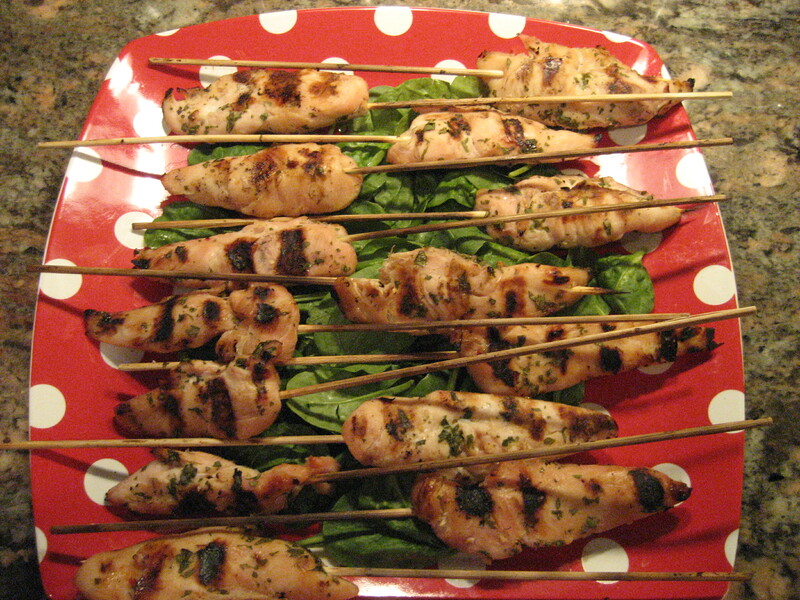 Arrange the cooked chicken skewers on a lovely bed of arugula or baby spinach and serve. You can certainly choose to garnish with fresh slices of lime. Garn-y is pretty. 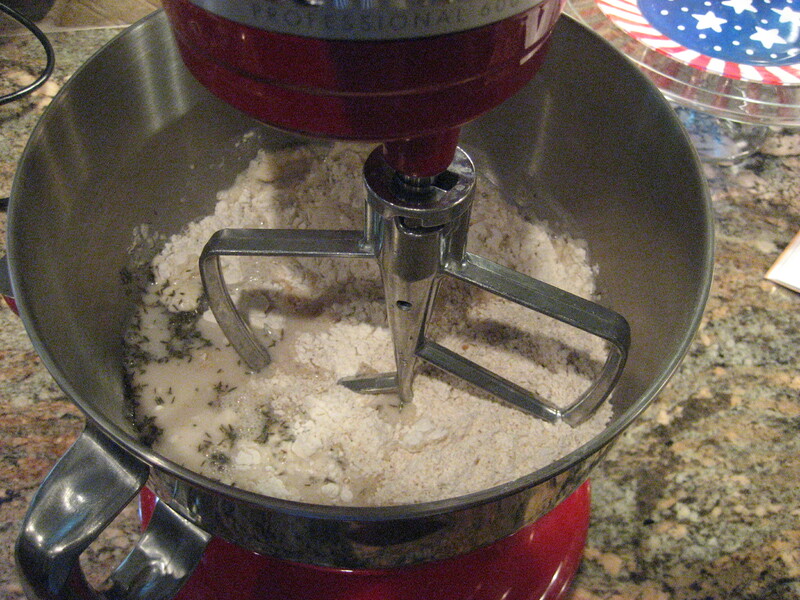 I did pull out the big, bad boy for this one…..my Kitchen-aid. 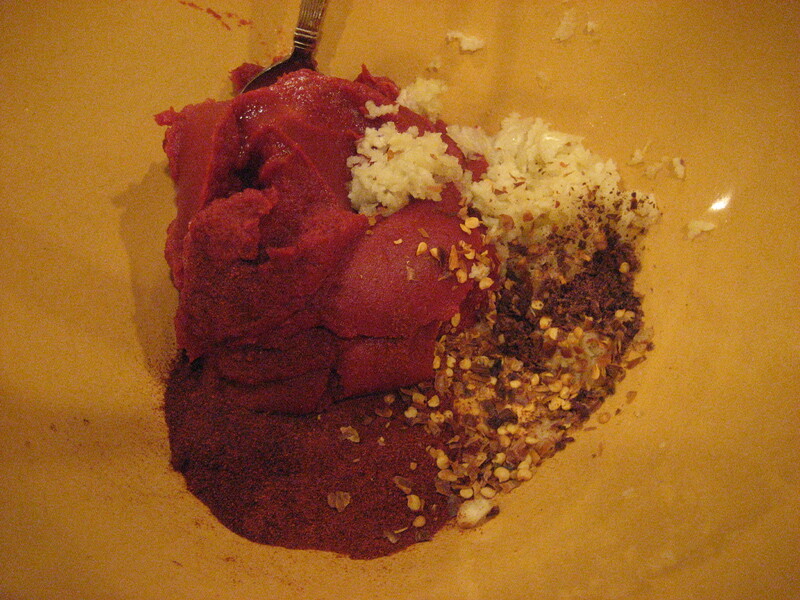 Beat at a low speed until well blended (scraping the sides of the bowl when necessary). 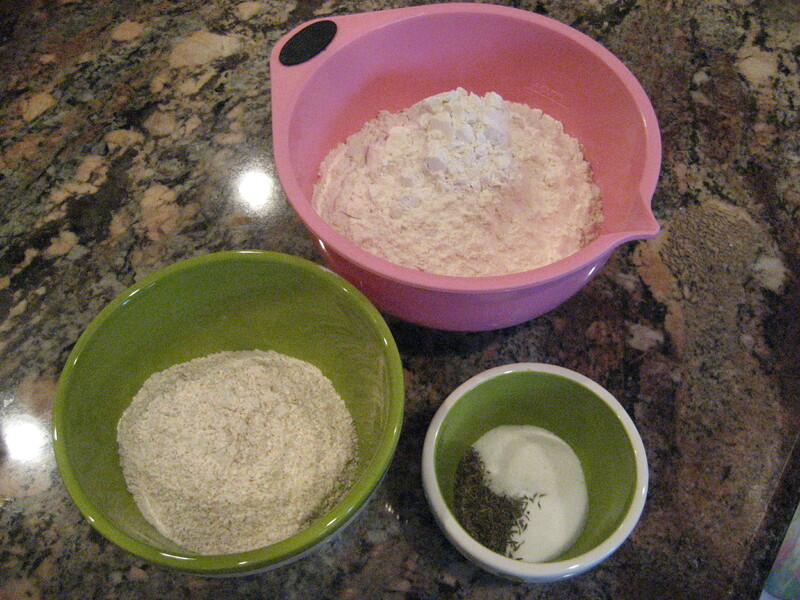 Stir in another 1- 2/3 cups of all purpose flour to make a good stiff dough. 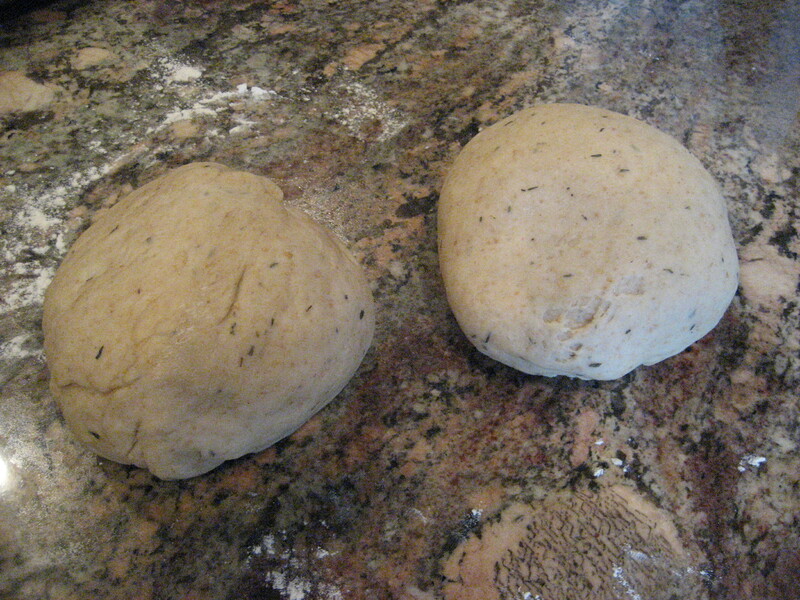 Cover with a towel and let rise for about 45 minutes (or until nearly doubled in size). Punch dough down. Turn dough onto a lightly floured surface and knead 4-5 times, kneading in an additional 1/3 cup of all purpose flour (who knew there was so much flour?). 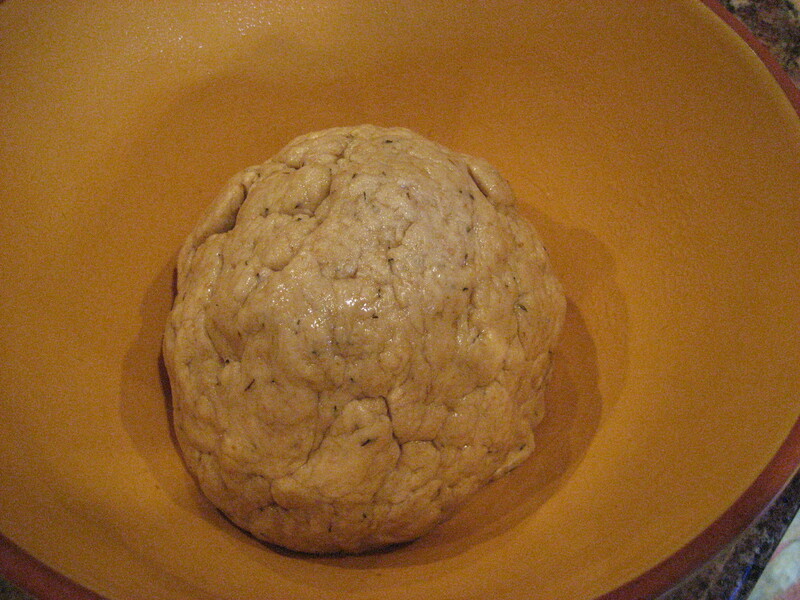 Divide the dough in half and shape into balls. Roll each ball into a 14” circle (yeah right! 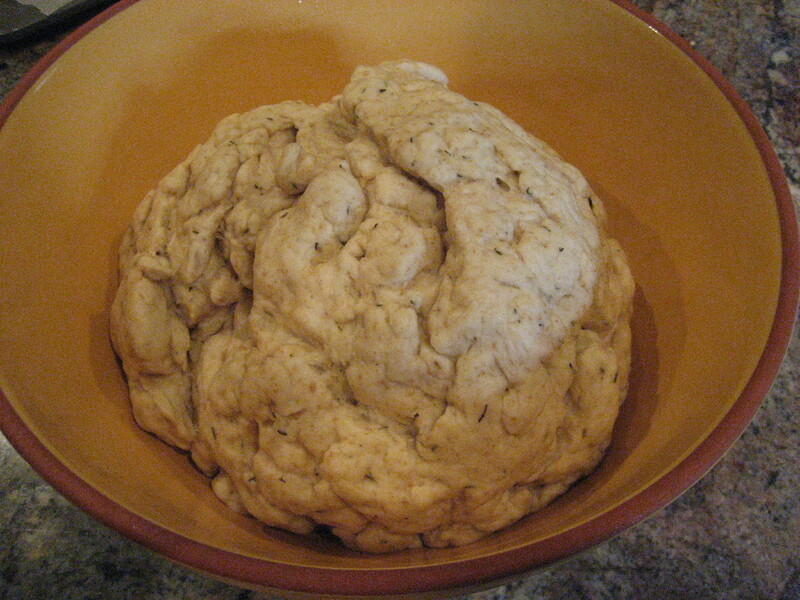 I actually loved the odd ball shape of my dough. It screamed homemade!). I did this the night before. 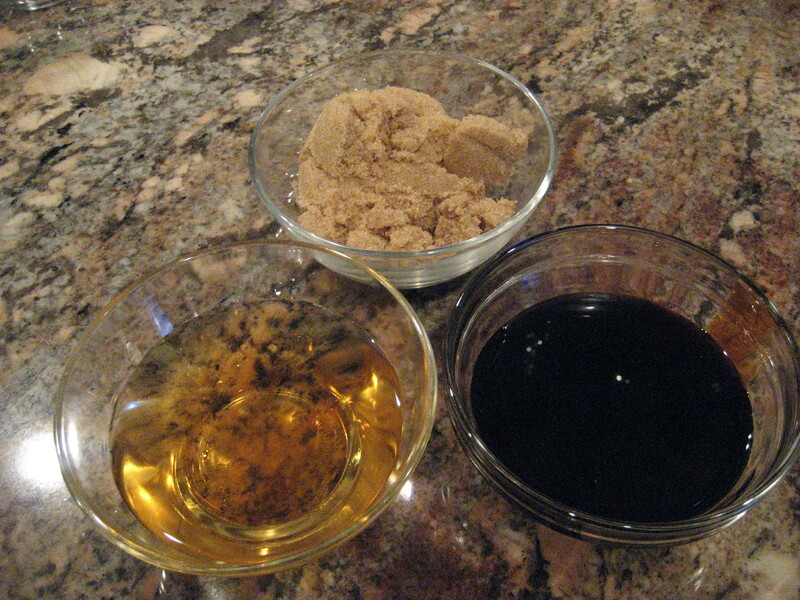 To store, I placed a piece of wax paper on a cookie sheet and placed to dough on top. 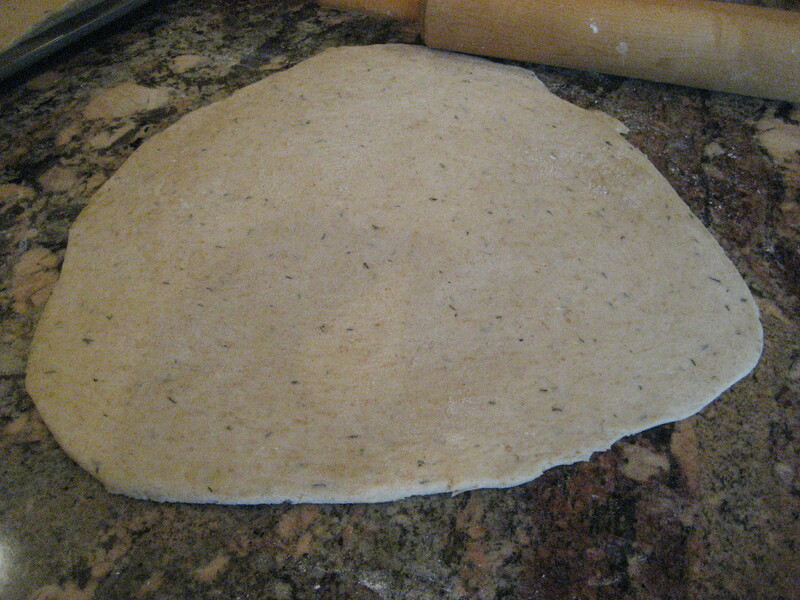 I layered on an additional piece of wax paper, and placed the second rolled out dough on top of that. 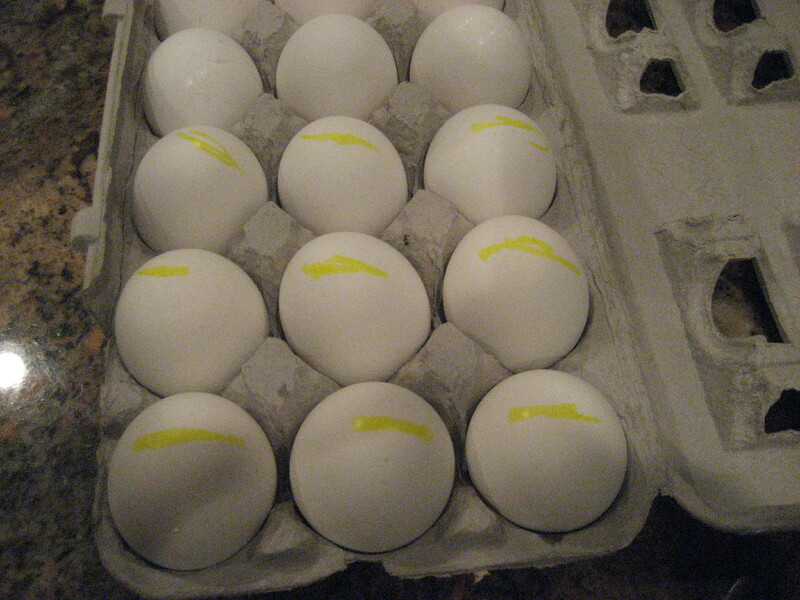 Then I covered the whole kit and caboodle with plastic wrap to ensure its freshness until the following day. NOTE: This dough freezes quite nicely. 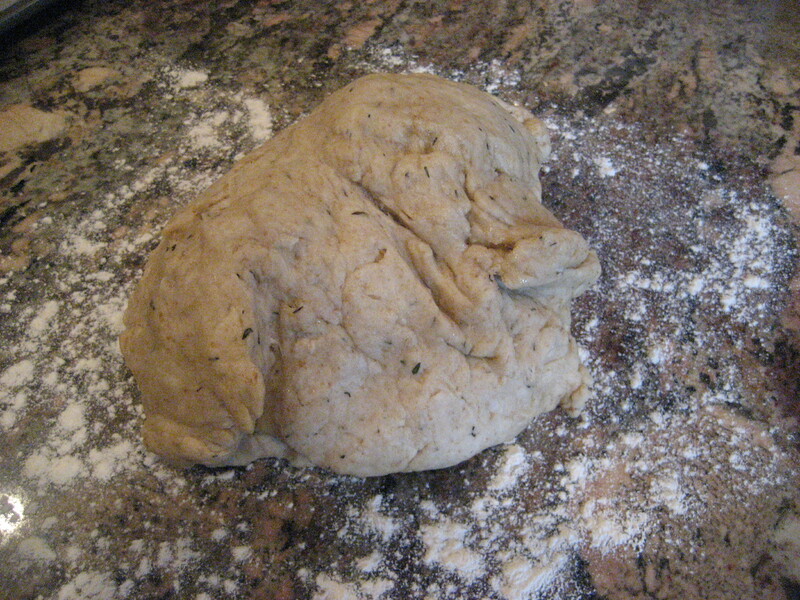 Simply divide the dough into two balls prior to the kneading process. Wrap in plastic wrap and place in a freezer proof Ziploc Baggie. 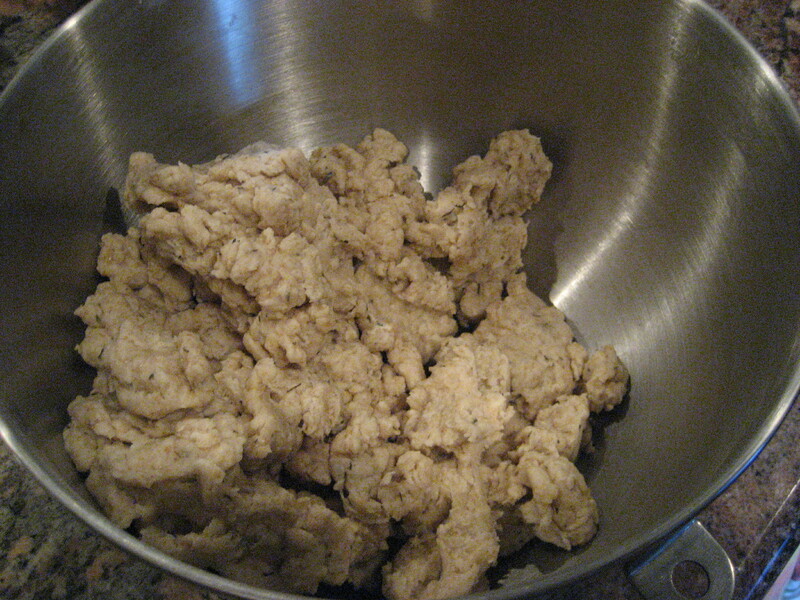 Thaw overnight in the refrigerator and pick up with the kneading process. 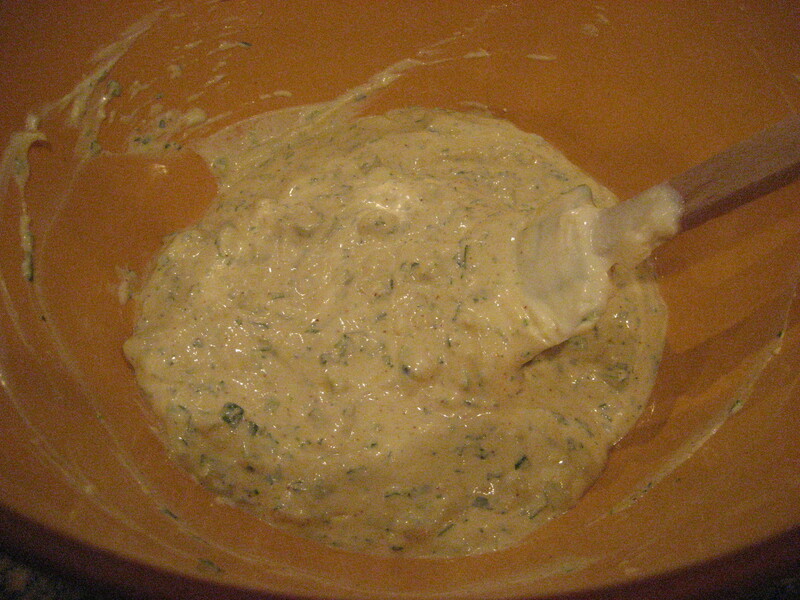 The dough can be stored in the freezer for up to 3 months. Now you should go crazy with the toppings! 6 slices of bacon, cooked and chopped (typically, I have cooked bacon on hand in the fridge because I cook it 2 lbs at a time. I store it, layered with Bounty Paper Towels (No endorsement, I’m just a paper towel snob.) and keep it in a sealed container. I pull it out for salads, sandwiches and burgers.). NOTE: I prepare my toppings the night before as well. 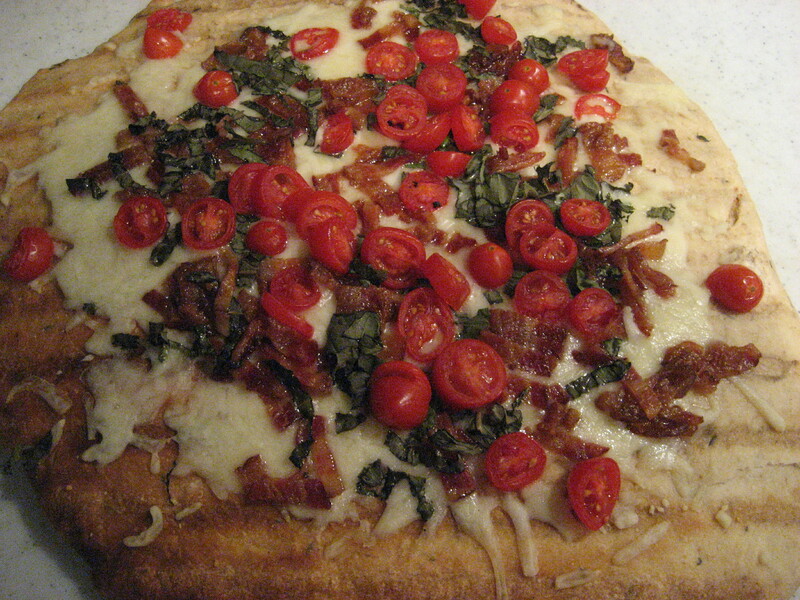 I wrap each individual topping in Bounty Paper Towels to absorb any moisture, especially from the tomatoes. Then I tuck them all safely together into a Ziploc baggie to keep them fresh. You’ve totally gotta love Costco and their bulk products (like baggies and paper towels….and everything else they carry). Pre-heat the grill to medium heat. 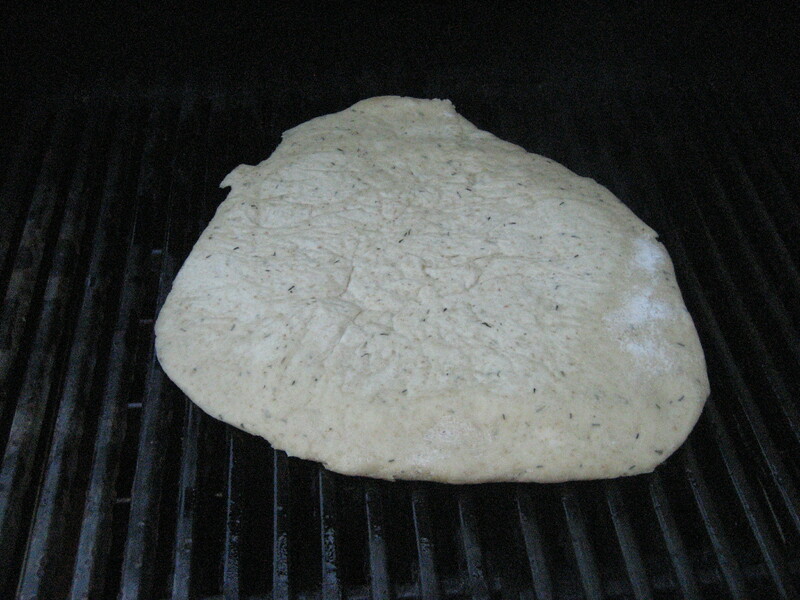 Brush oil directly onto the pizza dough and flip over onto the grill, removing the wax paper. Grill for 8-12 minutes (you may need to rotate for even cooking). 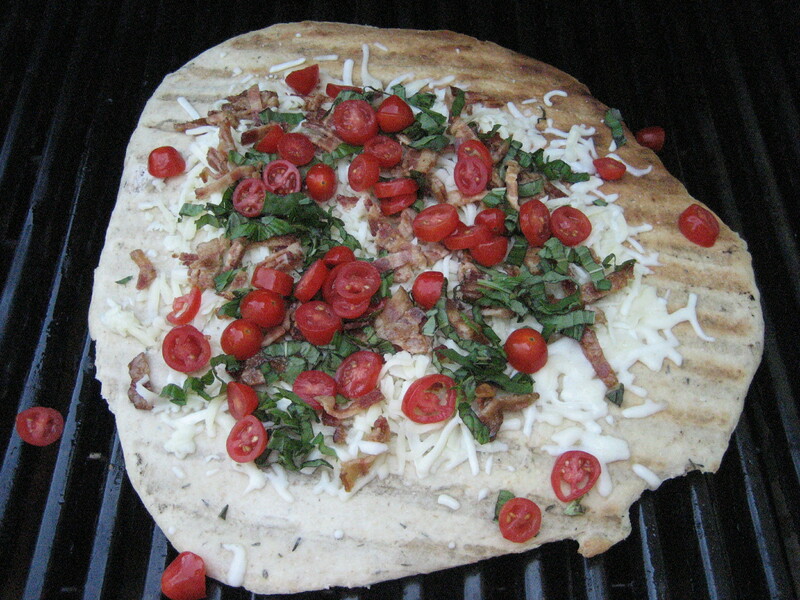 Brush oil onto the top of the pizza dough and with two spatula’s carefully flip over to the other side. Add your toppings. 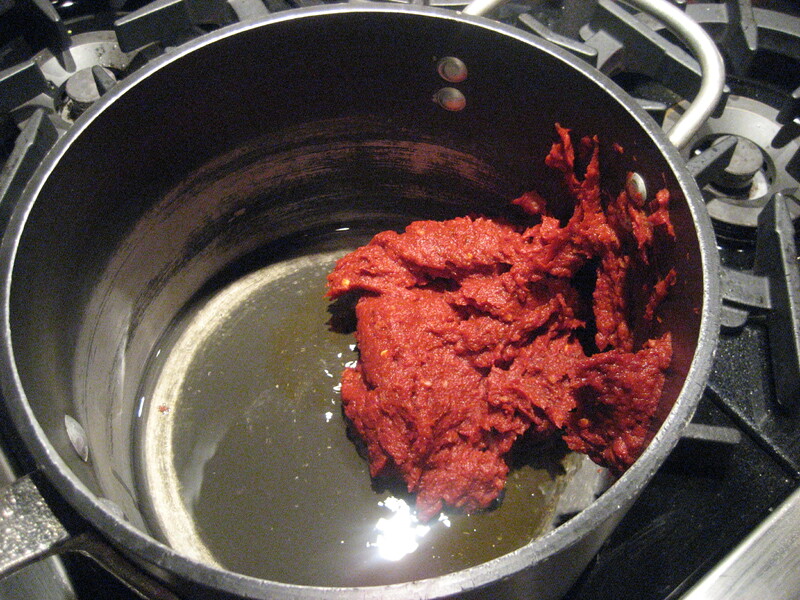 Cook for another 8-12 minutes (you may need to rotate for even cooking). Remove from grill. Let cool, slice and serve. Now I only hope you and your guests have paced yourselves and are ready for…..more tasty morsels! Fourth Of July Celebration, Day Two: The Entree Menu! July 4th is a day to celebrate with family and friends! As the More is More Mom®, my mission is to provide my guests with an experience they will fondly remember long after the party is over. To me, entertaining is like putting on a show; an extravaganza. I love for all of the details to be over the top. Now that we have welcomed our guests with a gorgeous and welcoming table setting and a whimsical buffet, it’s time to get to the heart of the matter……The Menu! The secrets to a throwing a great party are simple; gracious hosts, charming guests, lively mood music, tasty cocktails and plenty of delicious food. Over the next three days I can’t wait to share all of my recipes with you. I know this is completely out of order, but I am going to begin with the entrées, should you desire to incorporate them in to your own celebration. aren’t these plates darling? They are acrylic, made to look like paper from…..Target! 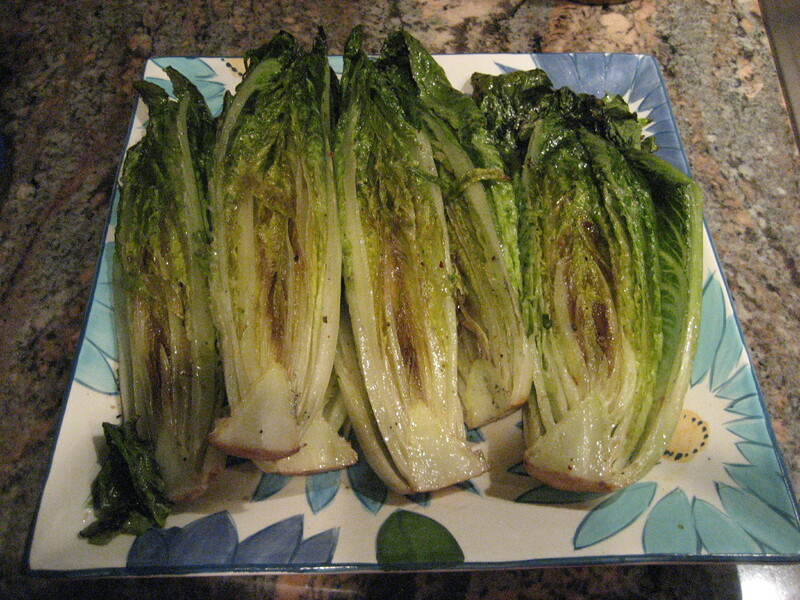 Because I like to do as much as humanly possible in advance, the night before my party, I sliced each head of lettuce in half, vertically, and slid them back in to the package, so they were ready to go. 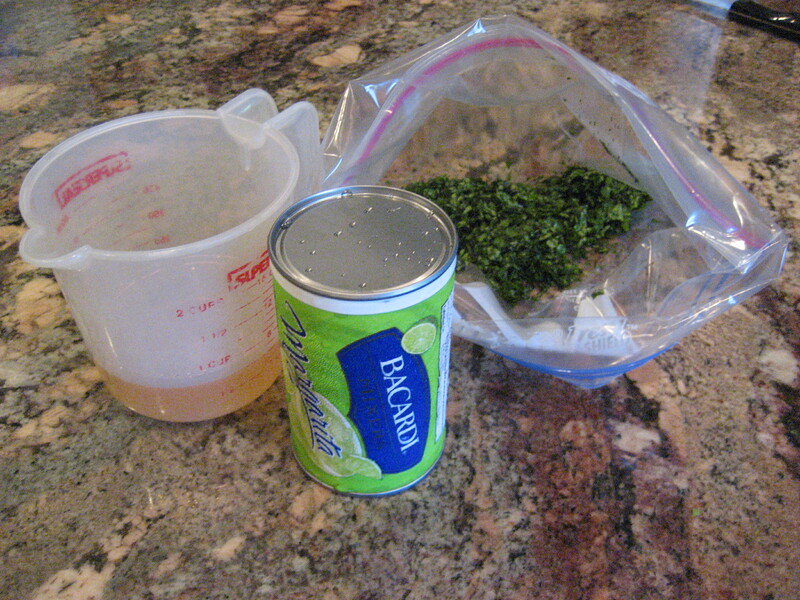 Early in the day of my party, I infused the olive oil with the herb seasoning. I love to have one less detail to attend to. My grill was already hot from cooking the ribs. 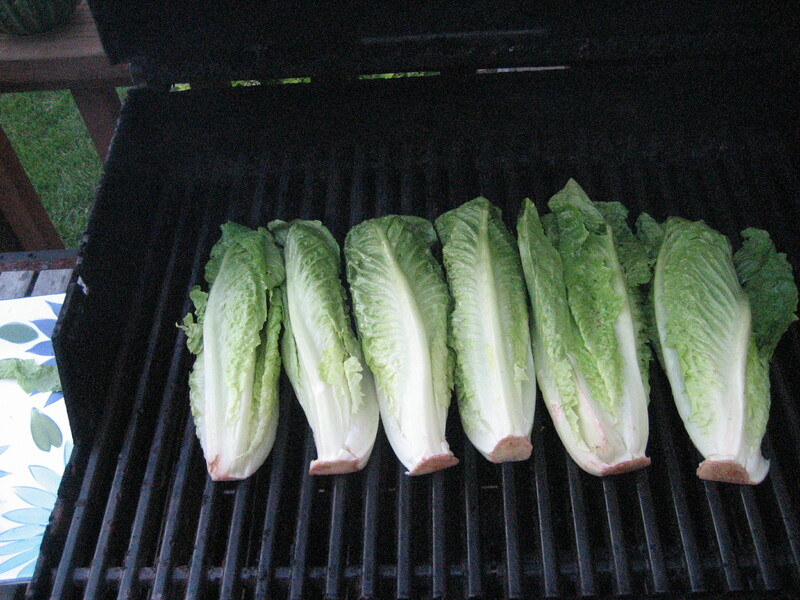 Chuck cleaned off the grill, lightly brushed the infused oil over the romaine and placed it directly on the grill rack. 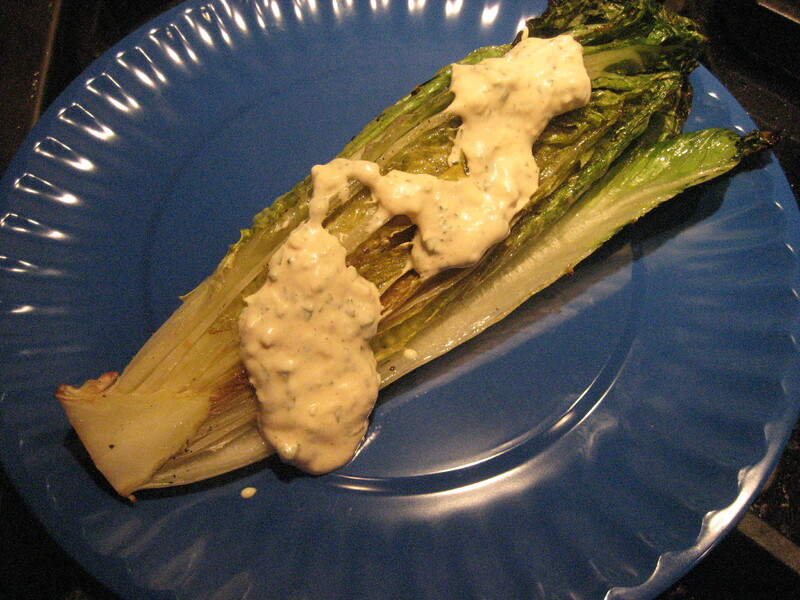 After about 5 minutes, he lightly brushed the lettuce on the up side, flipped over the romaine and cooked for another 5 minutes. The lettuce has a beautiful, smoky flavor. Top it with the Spicy Remoulade dressing and you will think you’ve died and gone to Heaven. How about that for rabbit food? Make your life easier and prepare the dressing the day before. 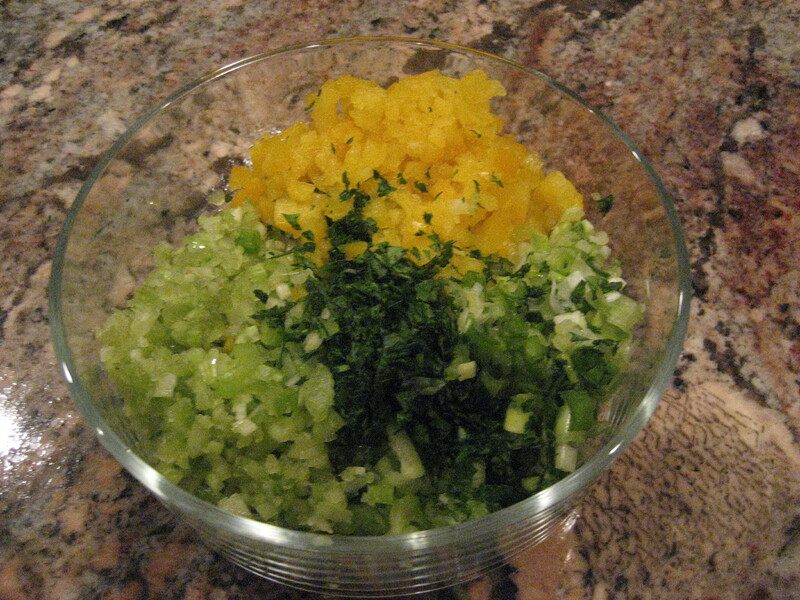 Again, the extra time allows for the flavors to blend together. Store in an airtight container. This was so good you could eat it with a spoon. It would also be fantastic served with a shrimp cocktail or as a topping on a sandwich. This is seriously the real deal. I’m a fan of Sweet Baby Ray’s BBQ sauce, but this is something else. I served 5 slabs of ribs and had plenty left over. Once again, make this a day or so in advance so the flavors get to know each other. 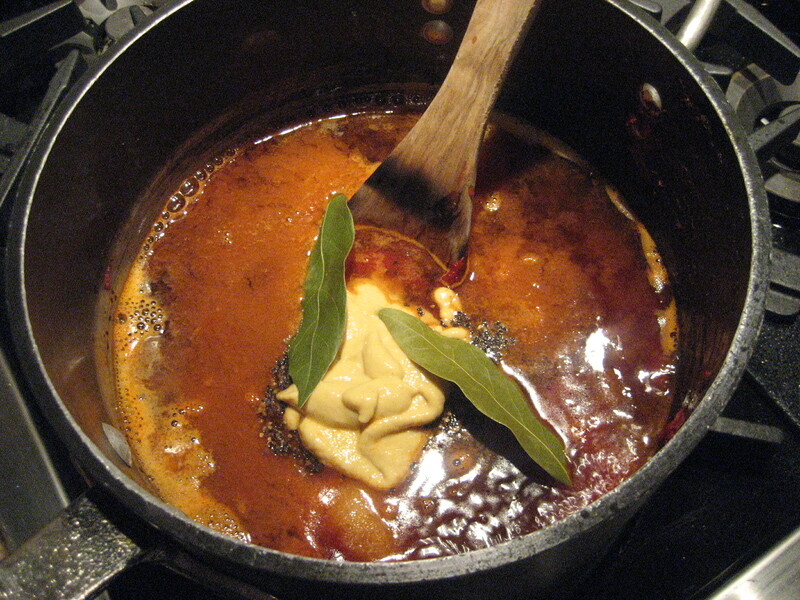 Heat 2 Tbsp of vegetable oil in a medium sauce pan. 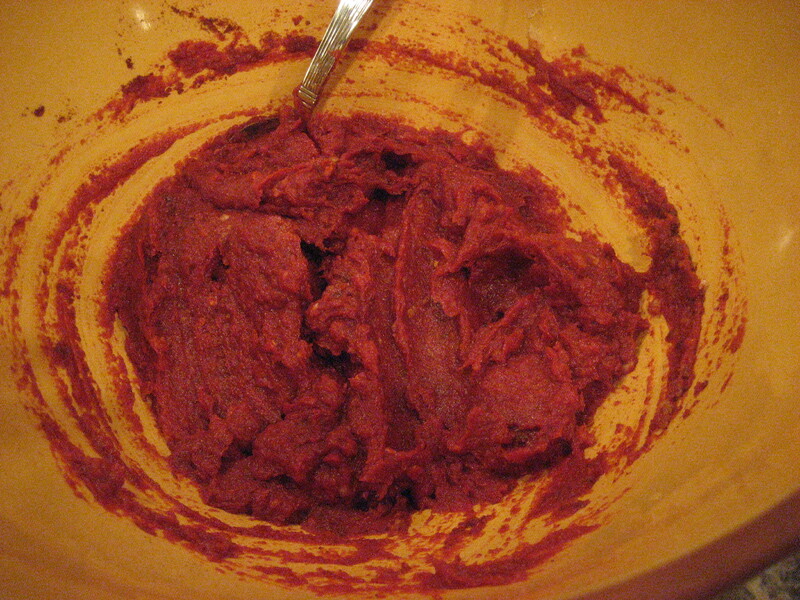 Stir for about 3 minutes, until the paste is a dark brick red. 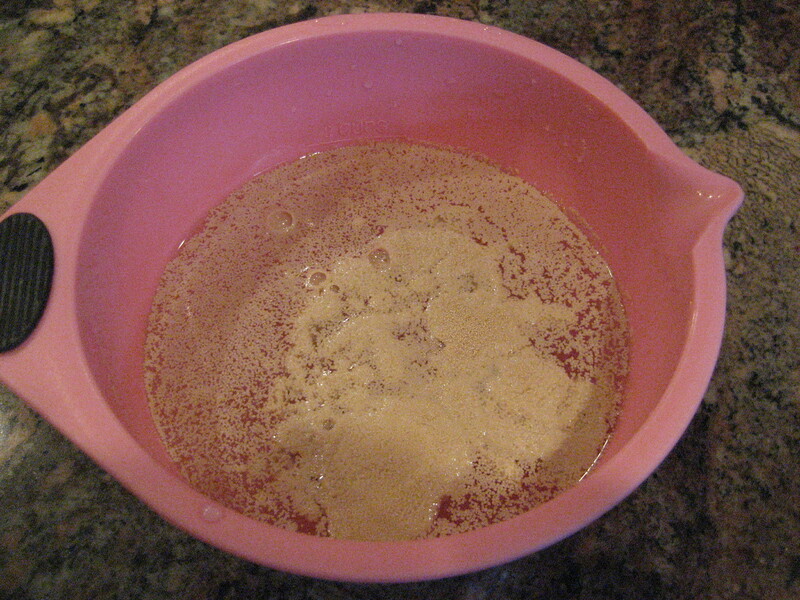 Adjust the heat to maintain a gentle simmer for about 30 minutes. Store in an airtight container. You know I live to be prepared. 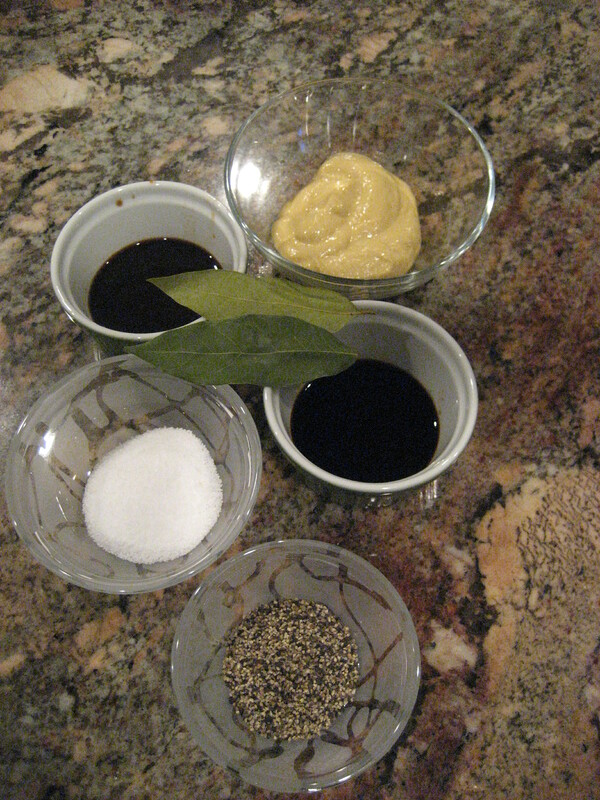 I mix my rub early in the day to ensure that I am not frantic when it’s time to get everything cooking. 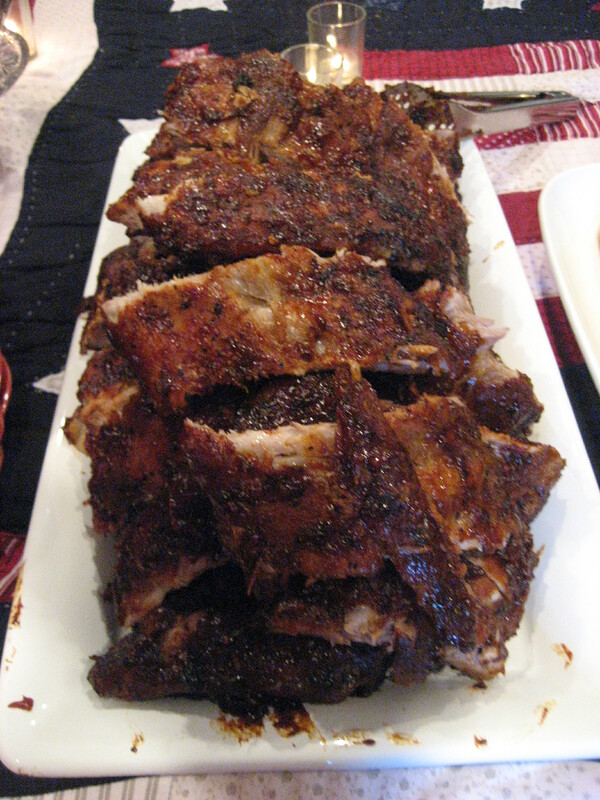 Kansas City BBQ typically calls for spareribs, but I always say use what you like. Line baking sheets (with a lip) with aluminum foil. You know how much I prefer a streamlined cleanup!). I could accommodate 2 slabs per baking sheet. 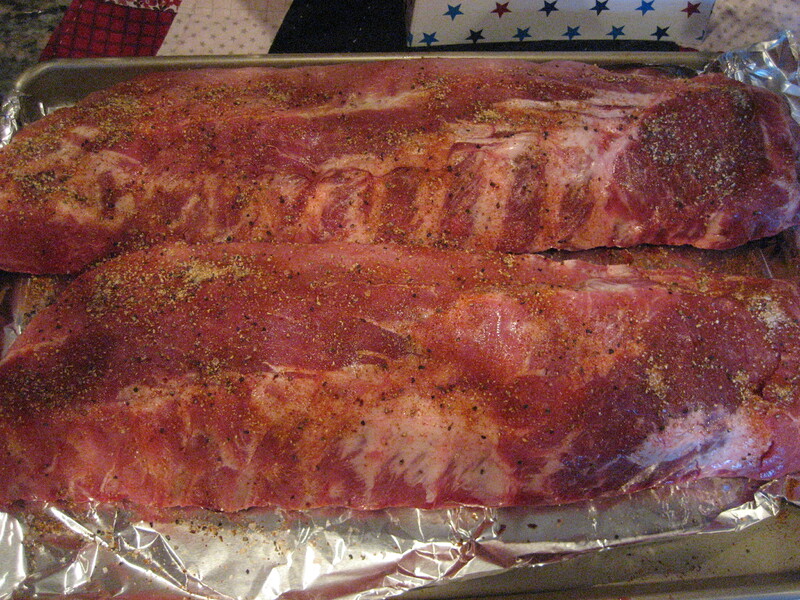 Rub the “rub” all over the ribs. 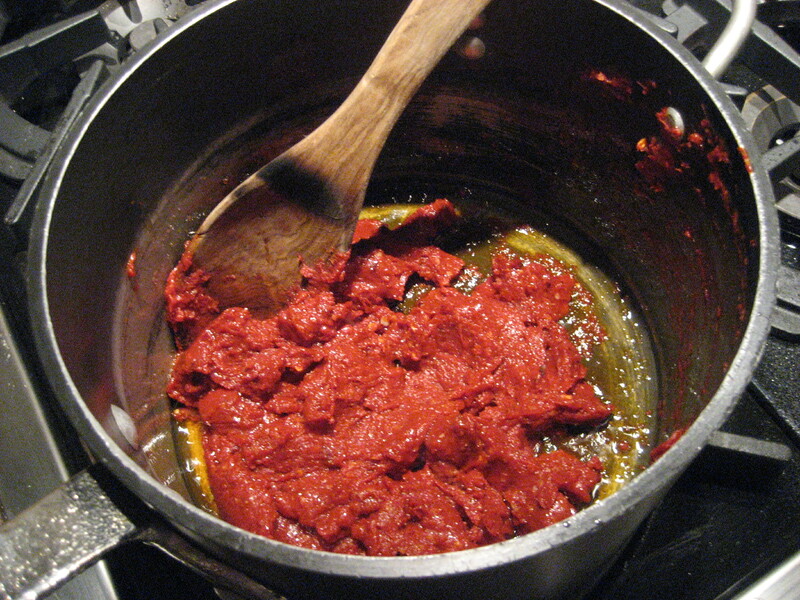 Slow cook for 1 ½ – 2 hours. Just watch them so they don’t overcook. 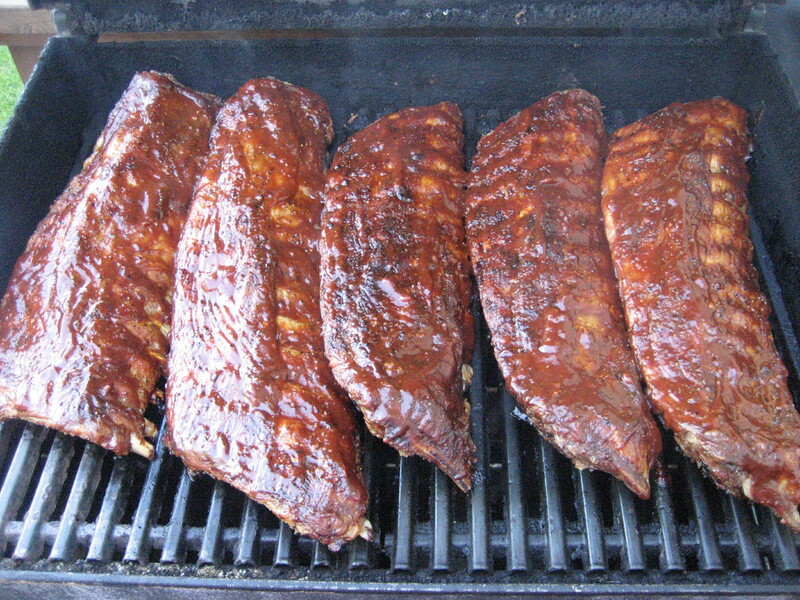 The ribs can be cooked up to 3 hours or so before you toss them on the grill. Simply leave them in the oven (or warming drawer) covered with foil. Warm up the grill to a medium heat, slather the ribs with sauce, and cook until the sauce gets a nice, baked on, caramelized glaze. Serve with additional sauce for mopping! Is your mouth watering already? This was unbelievable! You could absolutely cook it and serve right away, but who would want that mess? 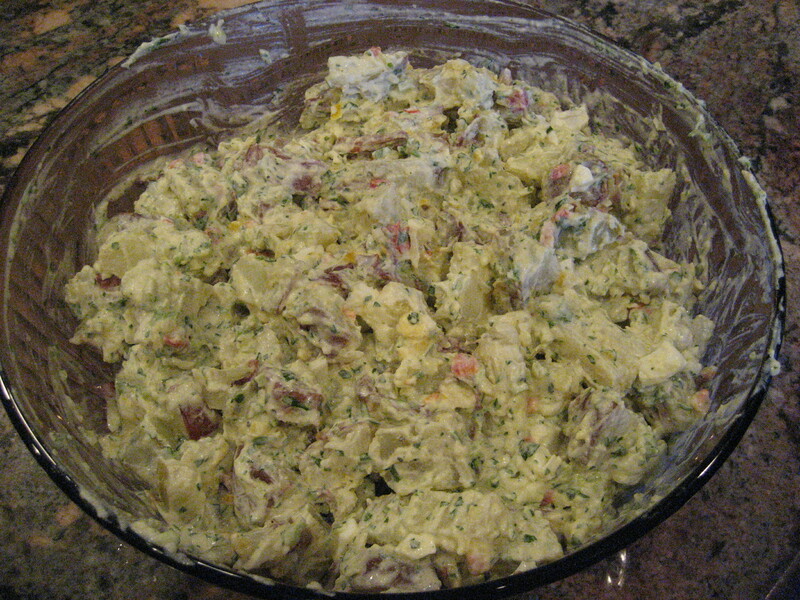 The beauty of potato salad is serving it cold. The day of your party…. 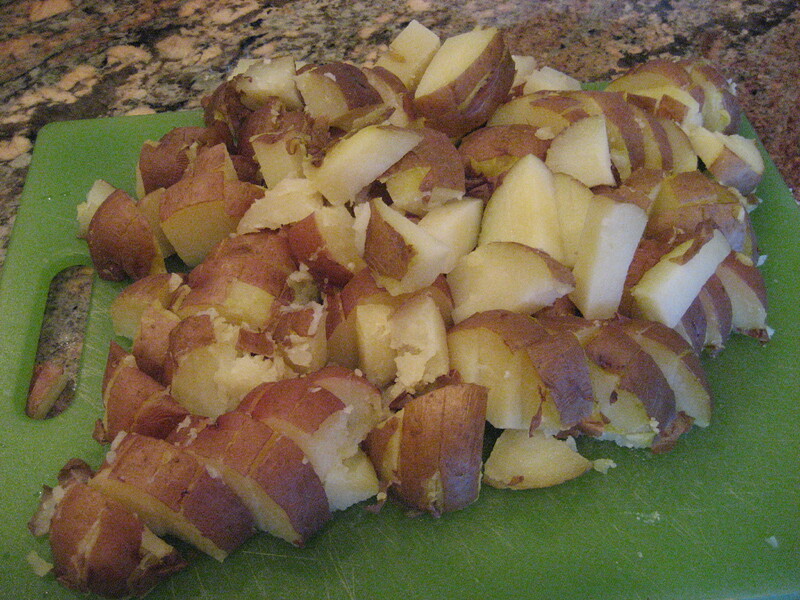 Boil 8 medium red potatoes for 15 minutes (I like mine soft and extremely tender). Allow them to cool to the touch. 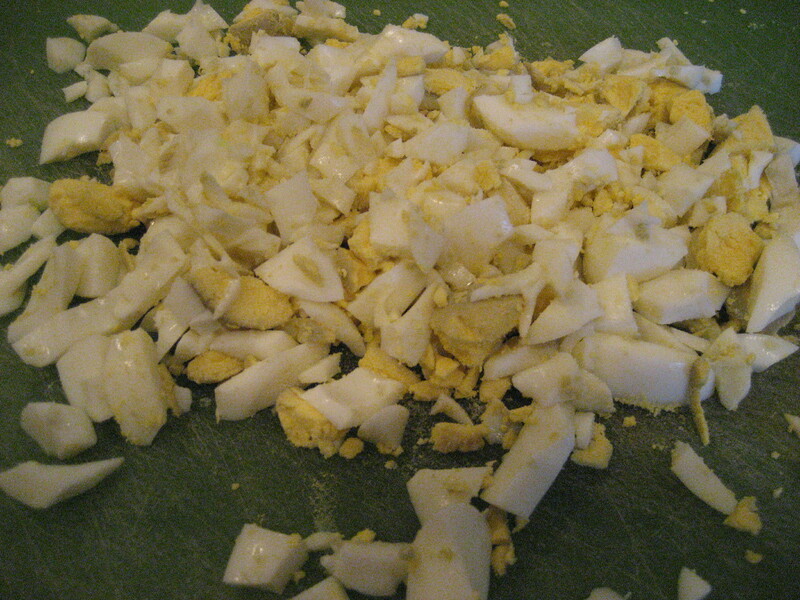 Cut in to cubes and set aside. Really mix all of these ingredients well. 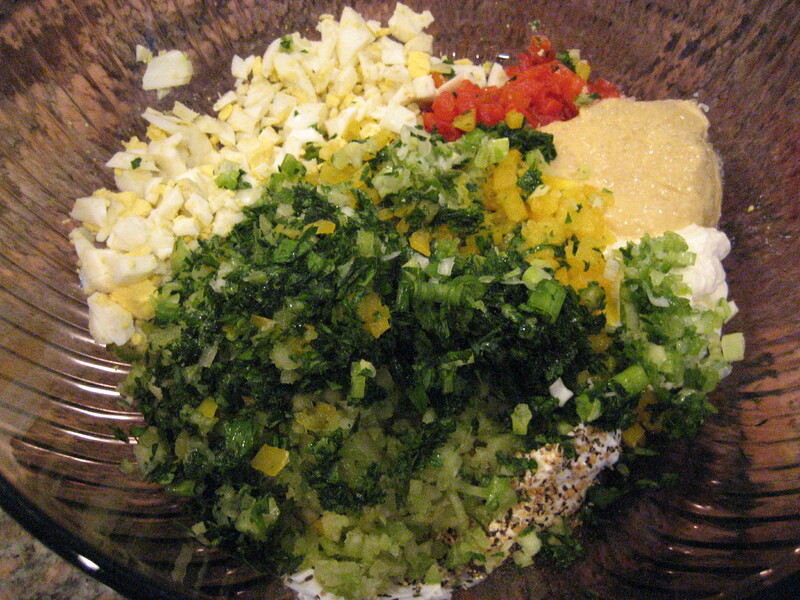 Add the cubed potato salad. 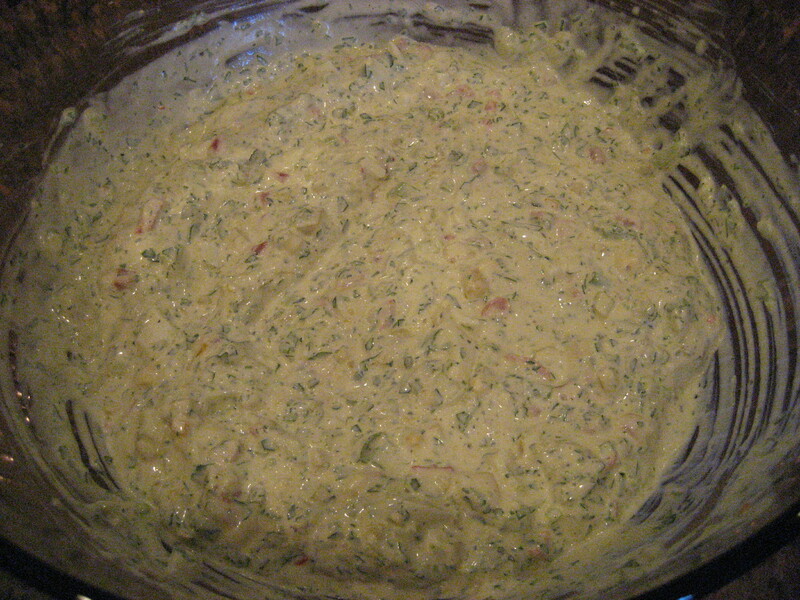 You’ve got yourself one rockin’, yummy potato salad. FYI- I also made baked potatoes for those not adventurous to eat potato salad. I wrapped the spuds in aluminum foil and cooked them with the ribs (only for a full2 hours). They looked quite appetizing too. Really now, what could be easier? 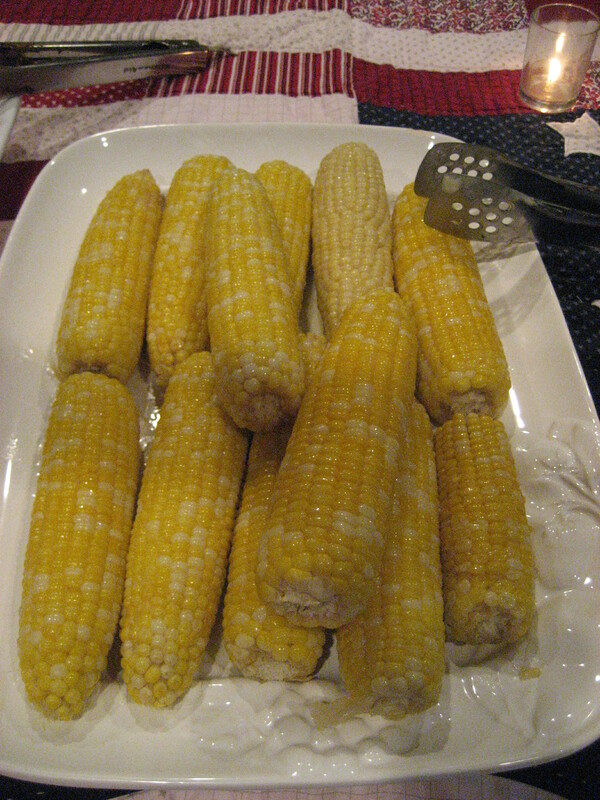 We shucked the corn the night before and stored it in a huge, 2 gallon, Ziploc baggie in the fridge over night. 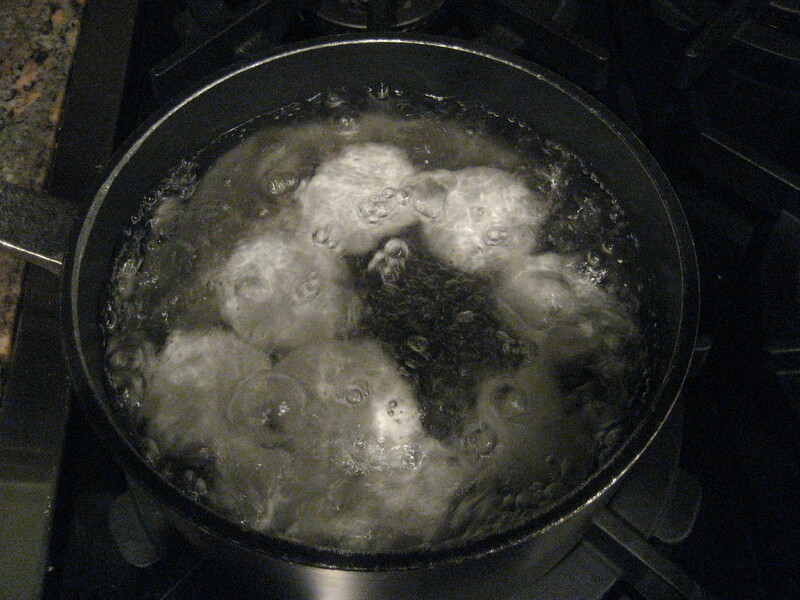 Boil a huge pot of water and cook the ears for 12-15 minutes. 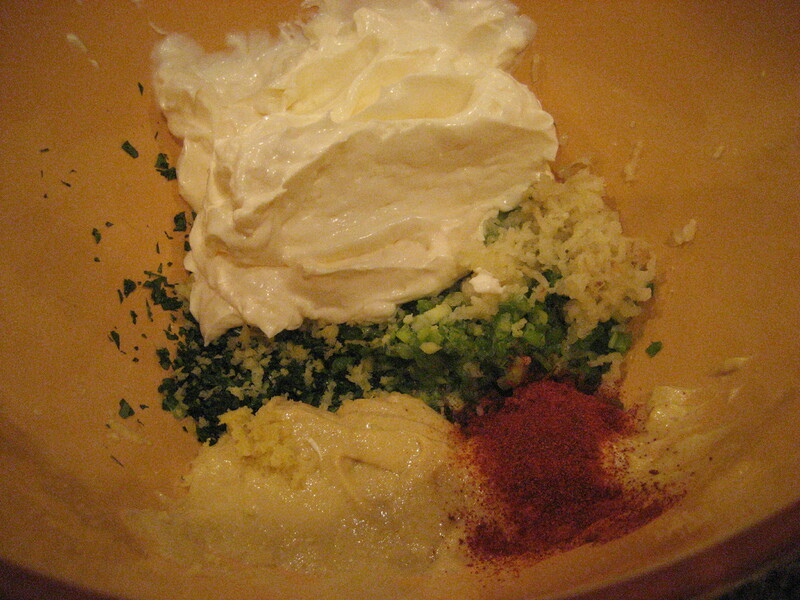 Drain, slather with an insane amount of butter (this is a holiday) and serve. What could possibly be better? I’m getting full just writing about this fantastic Fourth of July dinner….and wait; we still have appetizers and dessert. I hope you’ve saved…..more room! What’s more fun than more parties!?! There’s nothing more All American than commemorating Independence Day. I have an exciting week planned, and I can’t wait to share with you the details for a fantastic Fourth. Each and every day I will demonstrate my ideas for divine decorations and delectable dishes. Actually, we enjoyed a fabulous Father’s Day dinner last weekend. My family was kind enough to indulge me by celebrating the “Faux of July,” which made it possible to bring this to you today……. We had so much fun with our Memorial Day celebration, and we could certainly have used the same patriotic elements again this go around, but I wanted to show you how you could mix it up a little bit. I would have loved for us to dine al fresco, but Mother Nature has been so darn unpredictable (that’s not true, she’s very predictable….rain everyday.). We settled for cocktails and appetizers on the deck, which was perfectly pleasant…..and dry. My love affair with fabric, texture and color lead me to start, as it usually does, with a table covering. 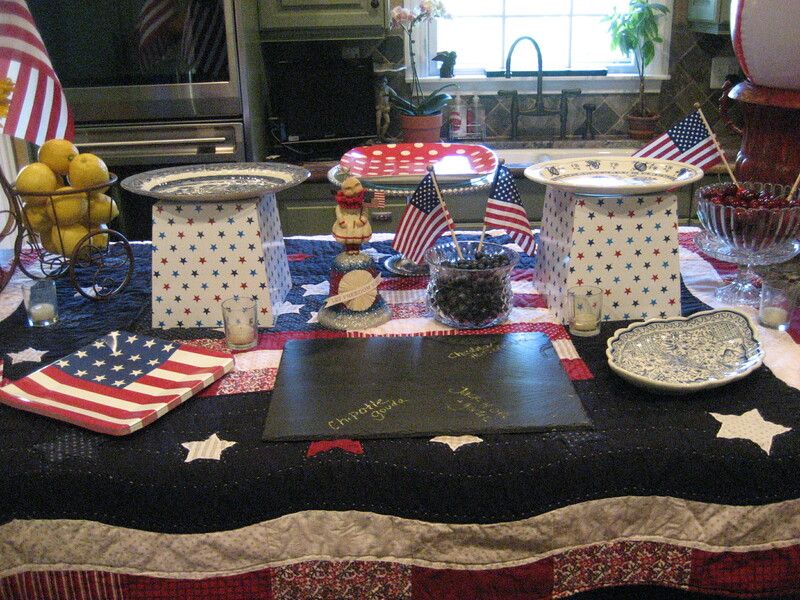 For Memorial Day I used a fantastic quilt as a tablecloth. 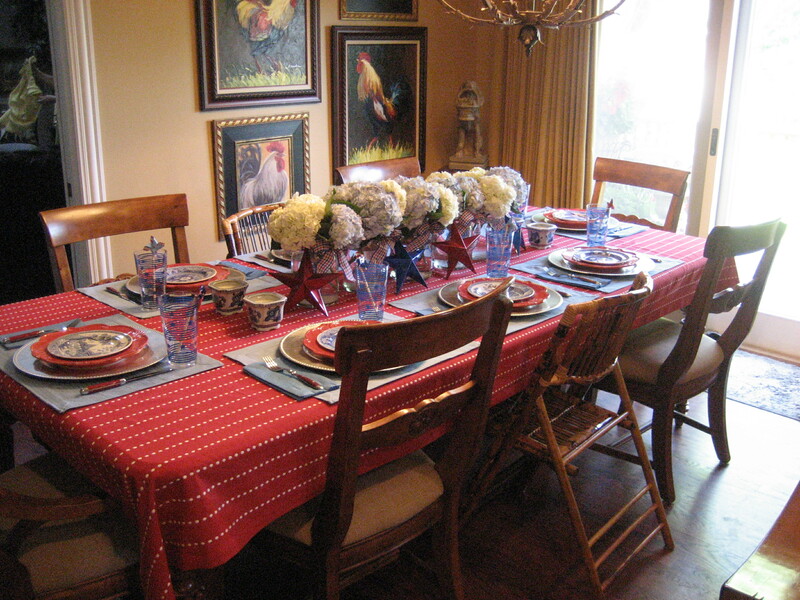 Today, I was inspired to use this very bold, red tablecloth with stripes made out of polka dots. Great attention to detail. Tablecloths are another of my collecting obsessions. This one is great because it is suitable for so many occasions; Valentines Day, Independence Day, Christmas Day and any other day you’re moved to entertain in a sea of red. Layers just add dimension and interest, so I always use a placement over my tablecovering. Here I selected a dusty blue (with a nice little tone on tone stripe) in homage to the Red, White and Blue. I topped that with a silver leaf charger, with a hobnail trim (which is a subtle tie in to the dots, in the stripe, of my tablecloth), reminiscent of the sparkle of…..sparklers! I pulled out these great red, stoneware dinner plates. I like the raised scroll detail. As always, I am taken with the way a snappy dessert plate pulls the theme of a table setting together (kind of like a great necklace or bracelet). For years I have been collecting a mish mash of blue and white plates that I use for appetizers and desserts. My collection stands at about 50, and I’ve used them all together, and their color combination is what unifies them, not the pattern. It’s just sort of groovy and eclectic. Here I enlisted the aid of two different patterned Spode plates and they look great (I alternated the pattern at every other place setting). I am morally opposed to paper products while entertaining, but this was an exception. My menu consists of two potentially, very messy food items; ribs and buttery corn on the cob. Having heart palpitations because the good linen napkins are going to be ruined is no way to go through dinner, so I picked up these sturdy, 2 ply paper napkins and gave each guest two. So much more relaxing for all concerned! 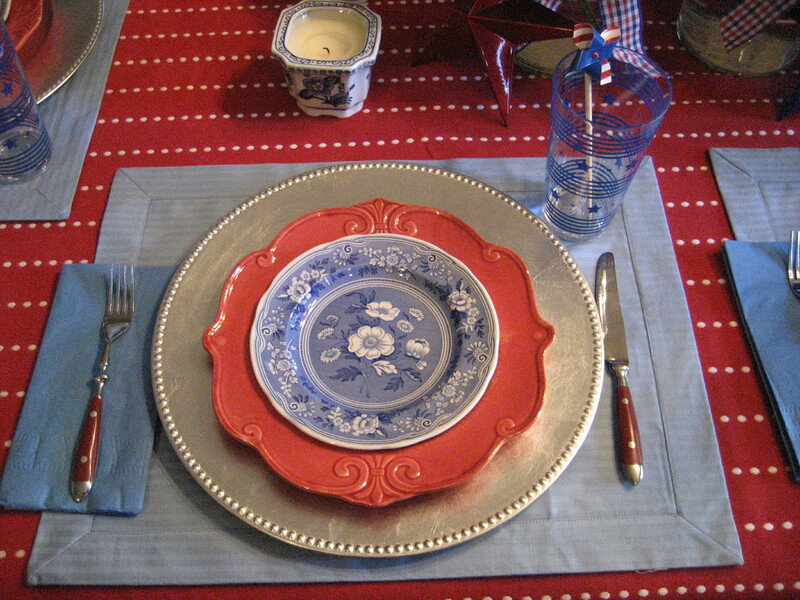 Red handled flatware showed off quite nicely against the blue napkins and placemats. You know I am a Target junkie, and I found these cute acrylic tumblers for $1.99 a piece. 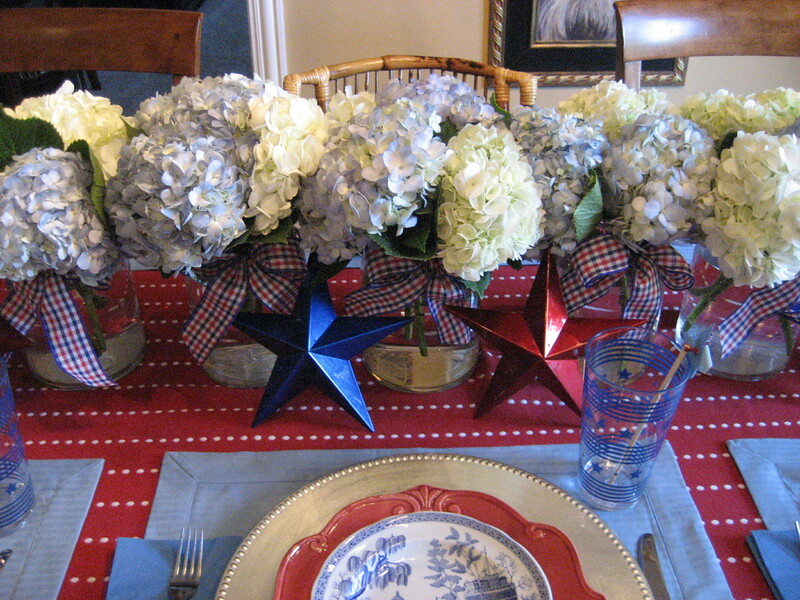 They’re perfect with their rows of blue stars (stars and stripes forever…). Each glass held a patriotic pinwheel. Alas, the centerpiece. A low arrangement was in order, as I wanted to be sure we could see each other across the table. 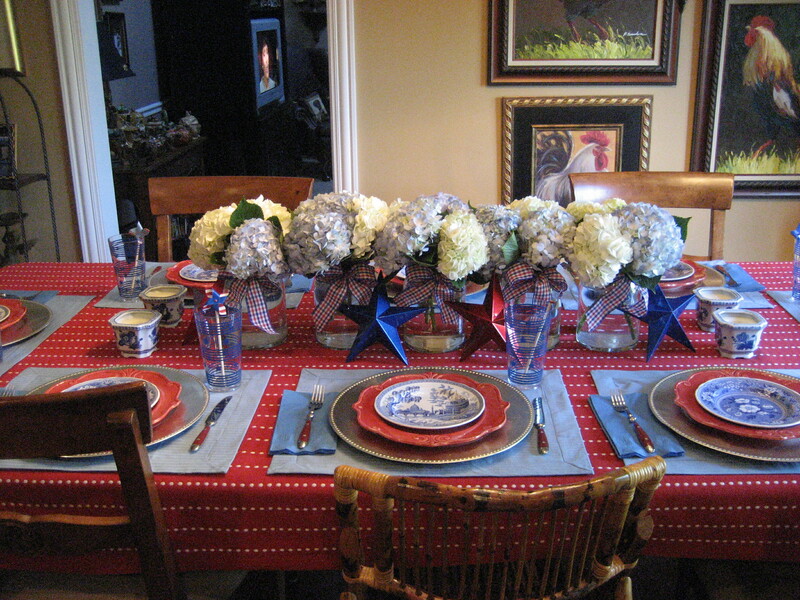 I set out five, simple clear glass vases and tied a red, white and blue wired edged, plaid ribbon around each one, for a little slice of Americana. The stripes on the tablecloth are white, so I was determined to find something sweet like white daisies. I raced and ran from floral department to floral department when Amanda and I popped in for a visit to our favorite Costco. Disappointed because there were no white flowers, I was about to settle on red roses, which were really much to formal for the occasion, when my gal pointed out bouquets of gorgeous blue and white hydrangeas. She is so smart! We brought them home, trimmed the stems so they would form a luscious, full cluster. Lined up together, they were stunning. To complete the look, I placed red and blue tin stars amongst the vases, and for a little romantic candlelight, resurrected blue and white votive holders to coordinate with my Spode plates. The table was lovely! For this party, my buffet was really just set up for appetizers, but I still wanted it to make a statement. Pattern and color always sets the tone, so I was excited to use this classic, flag, throw size, quilt as a topper (I’ve had it in my collection for so long, I don’t recall from whence it came. Target or Kohl’s would be a pretty safe bet.). My four appetizer offerings took center stage. Elevation always makes for a pleasing, and user friendly food display. A pewter, hob nail trim, pedestal cake plate stood proudly in the back. On either side (and slightly to the front) of the highest point, I wanted to present two additional, raised appetizers, without being so un-original and boring as to incorporate two more cake plates. How cute are these storage bins embellished with red and blue stars? They were open at the top, so I simply flipped them upside down, and voila….two tall, patriotic, colorful, pattern-ful stands. Flat on the table, lined up across from the tall, pedestal cake plate, is a slate cheese board (that my friend Mrs. Lilly found for me). It’s fantastic! People are forever curious about the flavors in beautiful gourmet cheeses. The slate cheese board offers a smart solution. With a piece of chalk, you can simply write down the sorts of cheeses you are serving. Genius! 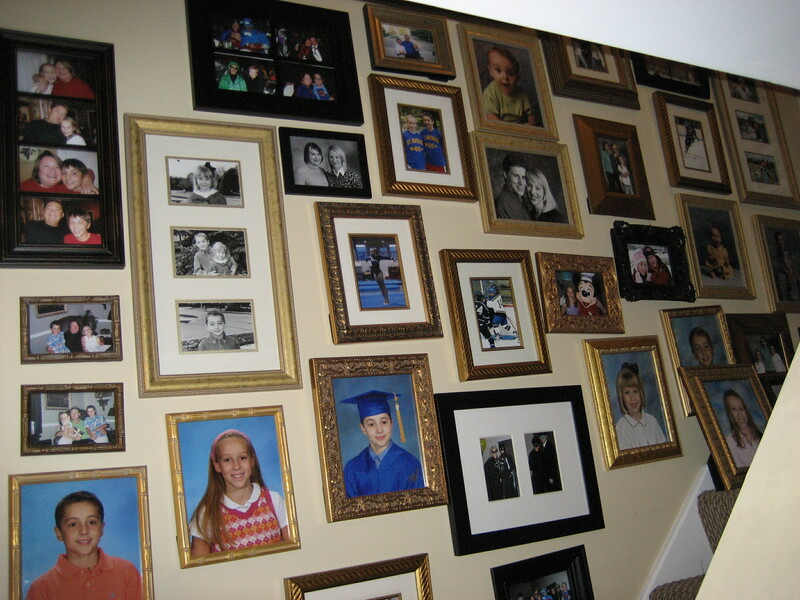 As the More is More Mom®, I could never leave a quiet, empty space, so I am inclined to fill in every nook and cranny! 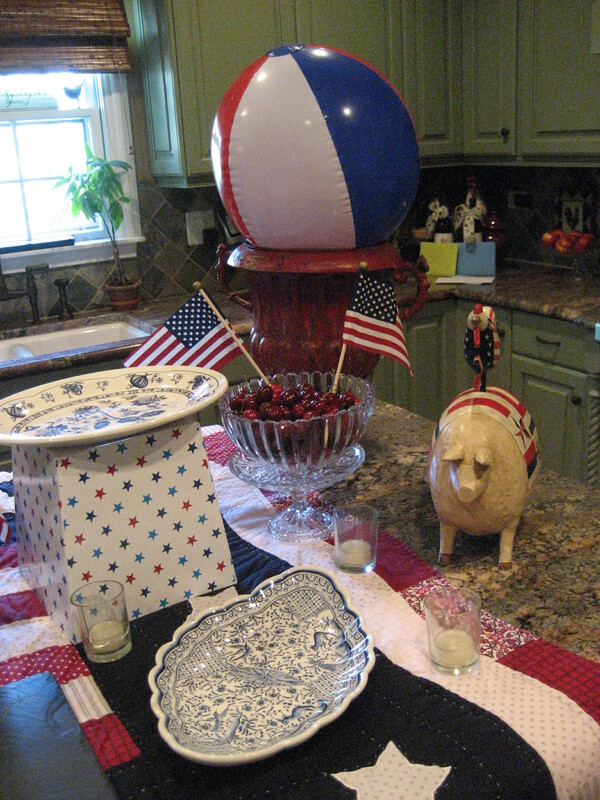 In the center of the table, I resurrected the Liberty Bell that I used for Memorial Day, and next to that I placed a crystal bowl full of fresh blueberries! 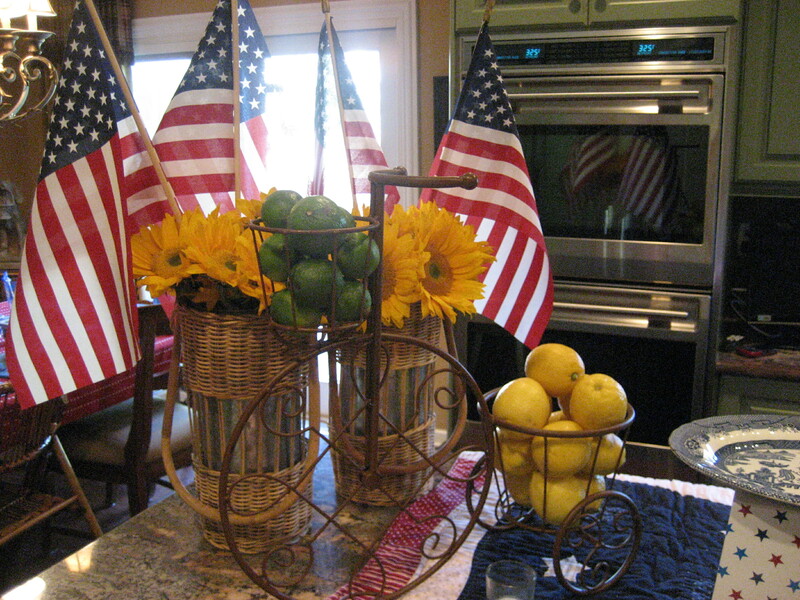 On one side of my Kitchen island, I displayed two tall arrangements of all American sun flowers. They are so happy! For nearly an eternity I have had these two tall galvanized cylinders which nest inside wicker, handled baskets. They remind me of a picnic, which is perfect for the 4th! I stuck two American flags in each for a dramatic backdrop. This may sound crazy, but I found this whimsical bicycle at my grocery store. Inspiration is all around us, we just have to be open to it…… I could easily have stuck potted plants at the base, and at the top, but I had so many beautiful flowers already. Instead, I filled one basket with limes and one with lemons for an Earthy, organic quality. On the opposite side of the island, I wanted something lively to fill the space. I knew I needed some height to mimic the other end of the buffet. At my Memorial Day bash, this red, rustic urn took center stage filled with mums, but today, it was the perfect place to rest a large, red, white and blue beach ball (height, color and shape…..a three-for). To the left, I placed a crystal bowl full of cherries and to the right a big, crazy pig with a rooster on top that sported the colors of the day. I scattered white tea light candles around the buffet for a festive glow and we are ready to party! 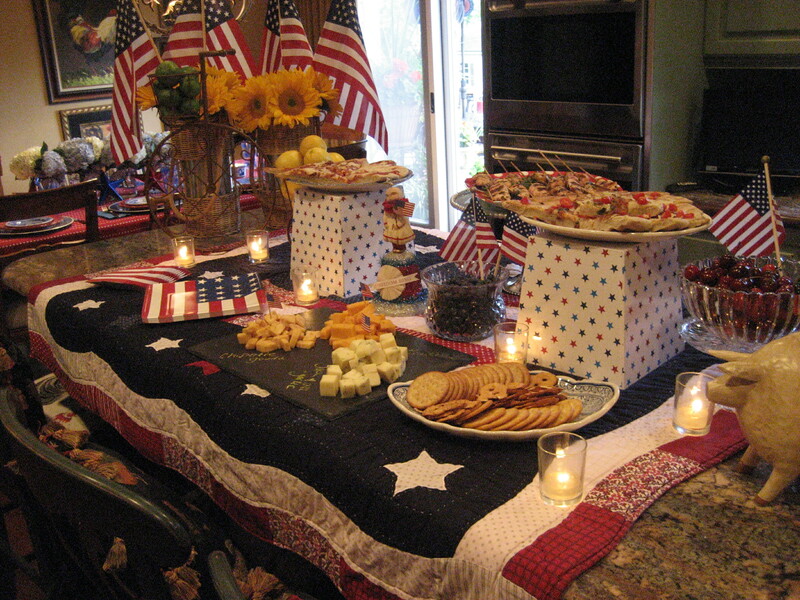 I hope you will be inspired to get creative and set a beautiful table and buffet for your Independence Day party this coming weekend. Tomorrow: Dinner Menu and recipes….guaranteed to be finger licking good! 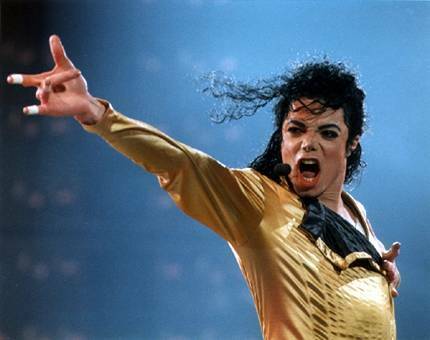 Michael Jackson….Long Live The King Of Pop! It is well known that Donny Osmond is my ultimate boyfriend. 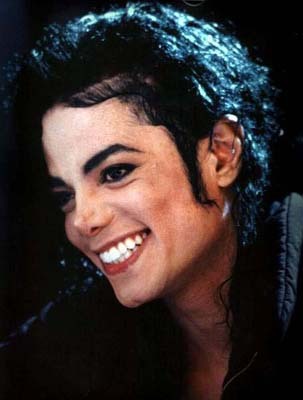 My all time favorite singer however, is Michael Jackson, BAR NONE. For years, both my cell phone ring tone and answer tone have been MJ’s; Shake Your Body (Down to the Ground). Every time my phone rings (which is like……. all the time (!) because I’m practically like a teenage girl and have the phone growing out of my ear. It bears repeating that it is a God send that we didn’t have cell phones when I was in High School because my already sketchy HS career would have been virtually nonexistent had I had a cell phone to occupy the balance of my time), people around me smile and I start to boogie…which is mildly embarrassing at the grocery store…..
As the More is More Mom®, I am all about…more Michael Jackson! Who doesn’t love the Jackson 5; ABC, The Love You Save, Never Can Say Good Bye, I’ll Be There, Who’s Lovin’ You, Rockin’ Robin, Santa Claus Is Coming to Town? These are the songs of my youth! My mom is awesome and has always been a total gamer, since the very beginning. Okay Chicagoans, I have the fondest memories of heading over to the Axel Roller Rink, on Harlem Ave, with my mom and my brother Ray on Friday nights and listening/skating to Shake Your Body (Down to the Ground) and my favorite Jackson’s tune of all time…Blame it on the Boogie!!! Sadly, with middle age, my mind has become a sieve. When I was eleven years old, my friend Holly and I went to see The Wiz at the movie theater on Clark Street, just South of Diversey Ave (does anyone remember the name of the theater?). 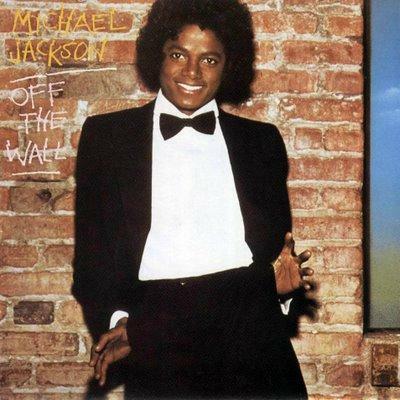 Then Michael Jackson’s Off the Wall album came out and I was in Heaven! Great tunes like; Rock with You, Don’t Stop ‘til You Get Enough and my 8th grade cheerleading squad did a pom-pom routine to Workin’ Day and Night (Michael is totally timeless. 25 years later, when my Nick was in 8th grade, he and his pals did Thriller in an 8th grade lip synch contest. 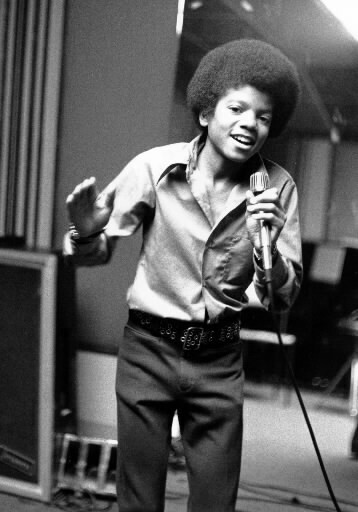 MJ just stands the test of time….). In a million years, I will never forget watching Michael Jackson do the moonwalk, wearing his fabulous sparkly glove, at the Motown 25th anniversary special back in the early 80’s. I still get goose bumps just thinking about it! I am the MTV generation. 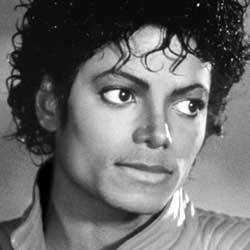 Come on…the Thriller Album; Billie Jean, Beat It, Wanna Be Startin’ Something, Baby Be Mine, The Girl is Mine (with Paul Mc Cartney! ), Human Nature, PYT (Pretty Young Thing) and of course…Thriller? Has any one single album ever had so many number one hits? I think not! In 1984, my very cool mom brought my brother and me to Chicago’s Soldier’s Field to see all of the Jackson’s in the Victory Tour! It remains one of the highlights of my youth (though, I also thoroughly enjoyed seeing Barry Manilow..because I am a Fan-ilow… at Ravinia when I was 13 with my dad.). I was crazy for Body and State of Shock, with Mick Jagger. Throw in a little We are the World in 1985, and you’ve got yourself a super, super star. How does one man top all of that? With Bad…..well, Bad, and I Just Can’t Stop Loving You, The Way You Make Me Feel, Man in the Mirror, Dirty Diana and of course Smooth Criminal (and I am all about Alien Ant Farm’s cover of Smooth Criminal. It’s amazing!). Round out a body of work with 1991’s Remember the Time (who doesn’t love Magic Johnson (?) as an Egyptian slave?) and Black and White (with Macaulay Culkin and George Wendt…Norm from Cheers). What an amazing body of work! I don’t think a day goes by that Michael Jackson’s music doesn’t touch my life; through his own music or the artists that he has inspired. Long live the…King of Pop!! Tagged as ABC, Axel Roller RInk, Bad, Barry Manilow, Beat It, Billie Jean, Black and White, Blame it on the Boogie, Body, Dancing Machine, Dangerous, Disco, Donny Osmond, I'll be there, King of Pop, Michael Jackson, Mick Jagger, Off the Wall, Rock with You, Shake Your Body (Down to the Ground), Smooth Criminal, State of Shock, The Love You Save, Thriller, Wanna Be Startin' Something, We are the World, Who's Loving You? So, I was cruising around the burbs yesterday. You know the drill; doctor’s appointment, errands, returns and window shopping for potential and inspiration, when my day suddenly brightened. I ran in to my gal pal Miss Margaret. I adore her. She’s always super fun and we got to chatting. One of her errands was to run in to Wolf Camera to order some digital pictures. This got me thinking. While I absolutely love that using a digital camera makes capturing a moment a pretty sure thing, I must confess that I have a fondness for old fashioned film. As the More is More Mom®, I love to take photographs. Back in the olden days, whenever I would drop off my rolls and rolls of film to be developed, I would always get them printed in triplicate….just in case. The results were frequently disappointing (out of focus, over or under exposed), but there was nothing like the thrill of ripping open the packages in my car, and discovering that one meaningful and special snapshot. Now the problem, of course, with this system is the piles and piles of useless prints. As a hoarder (nearly buried alive) I can’t bear to part with even the blurry photos, thus necessitating box, after box, after box, of Rubbermaid containers stacked to the rafters in my guest bedroom closet. Perhaps this is the reason those NASA type smarty’s invented the digital camera. The process of taking the digital photograph is really quite simple and extraordinary; point, shoot, view, erase, shoot, get your shot. You can do so much more with these digital files; download them to your computer, upload them to Facebook, upload them to your Blog page, send them in an e-mail, send them to Wolf Camera, for those that are completely impatient (like me), even print them out at home (though the quality isn’t very good). However it is a hassle committing four hours of your life, sitting at the kiosk, sorting through 500 images, cropping and enhancing your photos…..only to wind up with an $89.00 debt to Wolf Camera. Ah, the price of memories (I know I’m complaining, but it actually is TOTALLY WORTH IT!). What a complete contradiction; someone whole heartedly OCD, like me, lamenting the loss of the element of surprise. Call me old fashioned, but I miss my rolls of film, a real live receptionist answering the telephone, and full service gas stations. 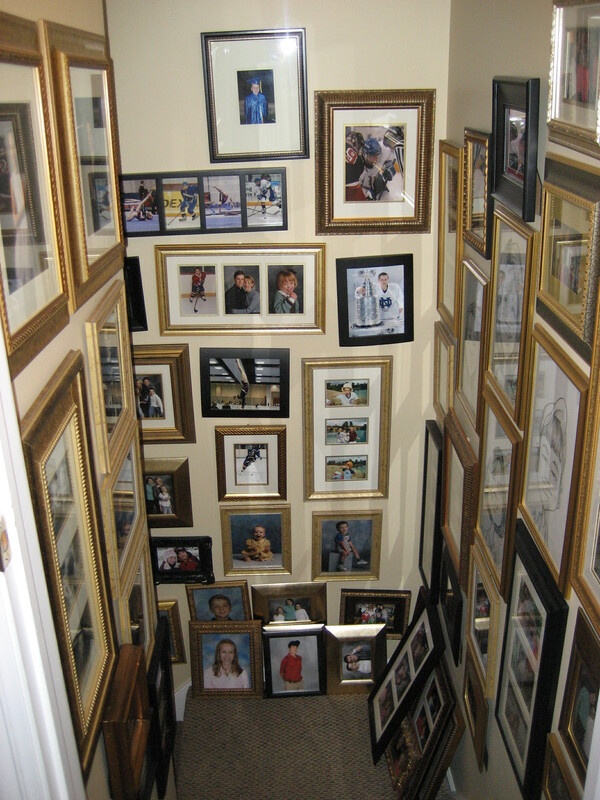 But, as the More is More Mom®, I recognize that it doesn’t matter how you get those photographs, what matters is that you’re left with the most important thing…..more memories!